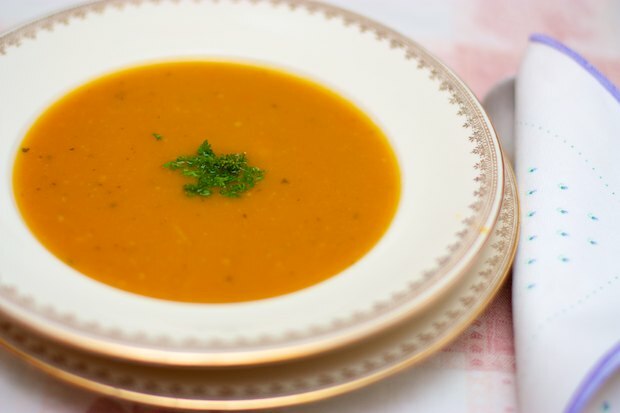 This creamy soup uses chestnut flour. Chestnut flour has a distinctive flavor that is enhanced by ginger. It’s good way to warm up a chilly night. Place the pumpkin, onion, sage and a little salt in a saucepan and cover with water. Boil for about 30 minutes on high heat. Mix the butter and chestnut flour with your hands (see recipe Chestnut Gnocchi with Autumn Sauce). Whisk in the pumpkin and cooking liquid with an immersion blender. Add the ball of flour and butter to the soup and stir with a whisk. Simmer until the soup becomes more dense. Add the granulated vegetable broth and ginger. Stir quickly and serve very hot. Arrivo qui per risponderti e trovo una ttceria da copiare ho tanta zucca!! !Cmq le mele che ho usato io sono tipo mele annurche (provenienti dagli alberi della suocera), ma pensa che vadano bene anche selle golden o delle renette, sulla rivista non specificava il tipo di mele (le deliziose ad esempio, trovo che abbiano un odore troppo preminente). Ciao! !